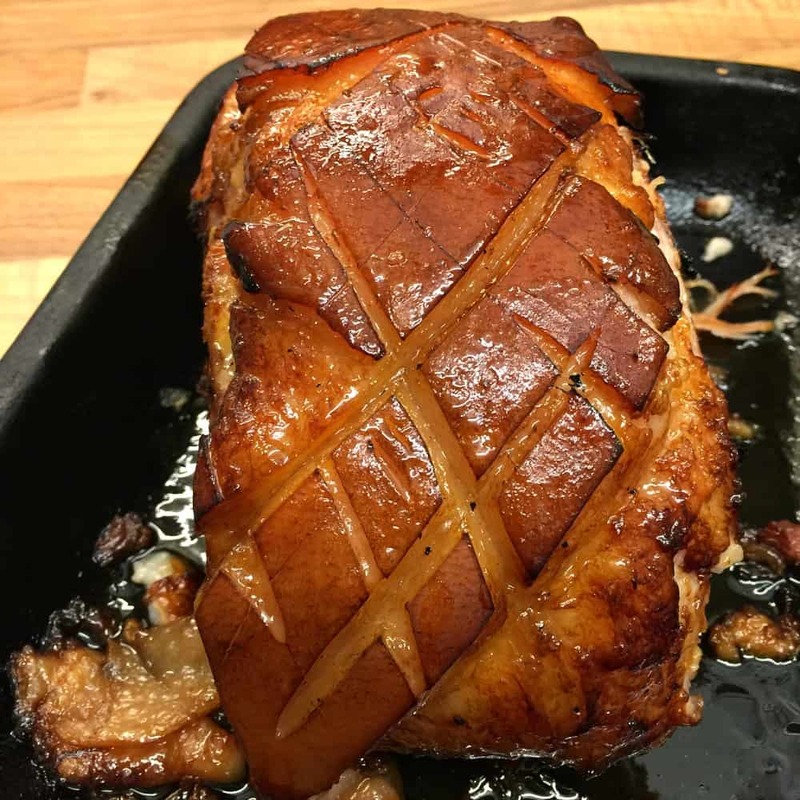 Great for your Christmas or New Year table, and also perfect for a Sunday roast all year round, slow cooker gammon glazed with maple syrup is so easy to make and bound to be a hit with your family. The maple syrup makes the gammon or ham just taste sublime, with that sweet but mellow flavour. 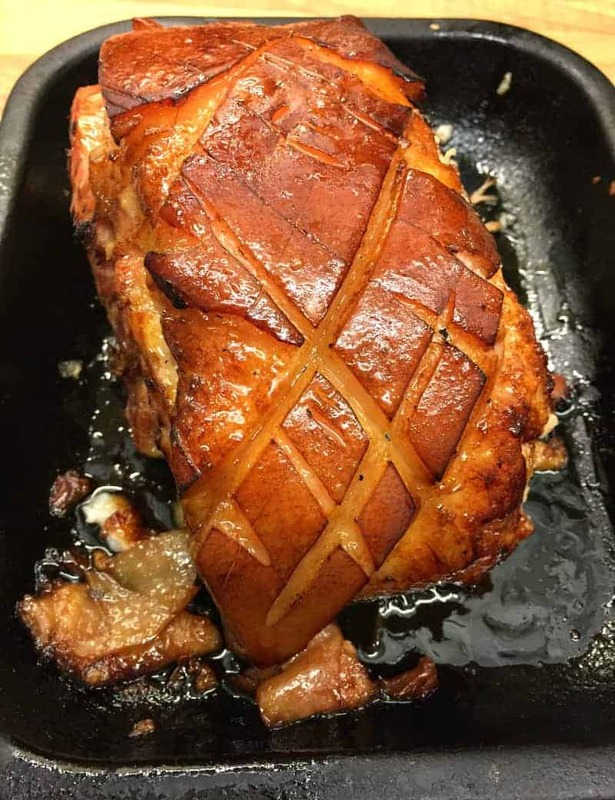 This gammon is cooked in apple juice then glazed with maple syrup and roasted briefly in the oven to give this marvellous result. 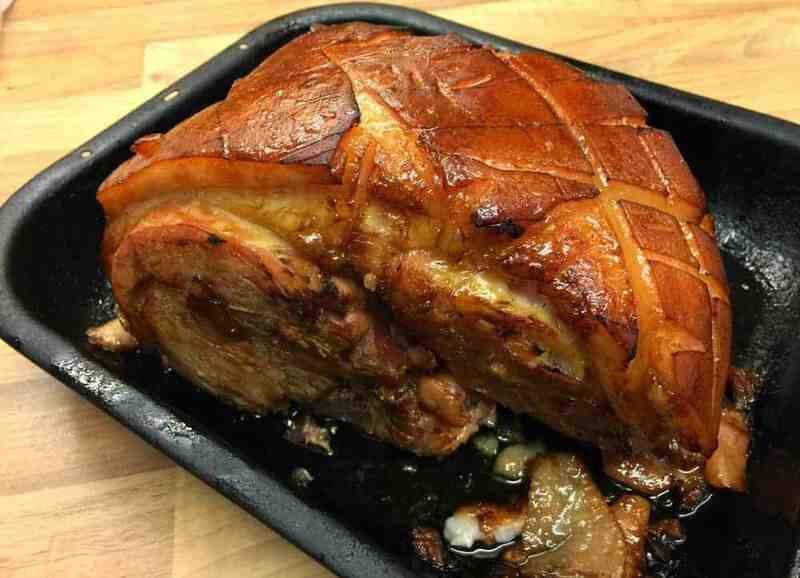 If you are not from the UK where gammon is a common cut of meat, then gammon is an uncooked cured piece of pork leg, which we buy uncooked from the supermarket, either as smoked or unsmoked gammon. I prefer unsmoked as smoked is very salty. We often soak gammon before cooking to remove some of the salt. I find that choosing unsmoked usually makes this not necessary. We then cook it either in the slow cooker or by baking in the oven to make ham. So gammon could be called a fresh ham, as you need to cook it before eating it, as it is raw. No slaving over a hot oven for hours or checking water levels in a pan required here. Just put the gammon in your slow cooker and off you go! Over the holiday period you can simply pop the gammon in the crockpot and do something else, a spot of present wrapping, writing Christmas cards, visiting friends. You can even cook this overnight if you are short on oven space for your festive dishes. 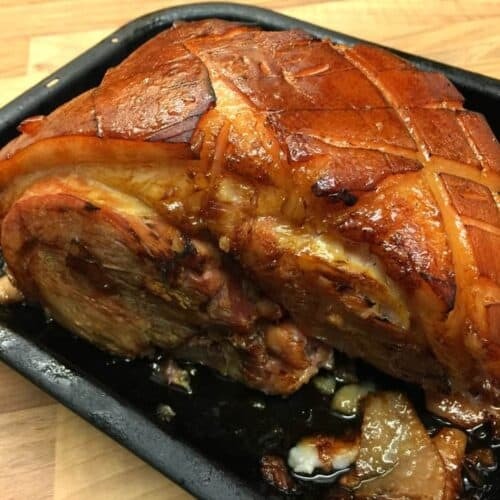 Just half an hour in a hot oven at the end and you will have a golden gammon joint which is so tender inside from slow cooking in apple juice. If you are looking for Christmas recipes for your slow cooker you are in the right place! 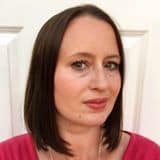 I’ll have more slow cooker Sunday roast recipes coming up soon, why not subscribe by email so you don’t miss a post. Pin my slow cooker gammon for later! Place the gammon in the slow cooker, pour the apple juice in the bottom, replace the lid, and cook on low for 8-10 hours, or on high for 5-6 hours. About half an hour from the end, preheat your oven to 200 degrees. When the cooking time has passed, carefully use two forks to remove the gammon from the slow cooker and place it in a baking tray. If the gammon has string on it, remove it now. Pat dry the fat on top of the gammon using kitchen roll, then score it in a diamond pattern using a sharp knife. Pour the maple syrup on top of the gammon. Place the gammon on the baking tray in the oven and cook for half an hour, until golden. Baste occasionally with the cooking juices and maple syrup during cooking. Remove from the oven, leave to rest for at least ten minutes (if you try to cut it straightaway it may shred rather than carve as it is so soft), and then carve. 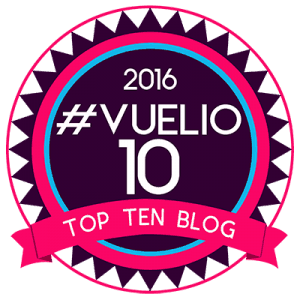 Post originally published January 03 2016. Images updated December 18 2018. Maple syrup is such a brilliant ingredient isn’t it? Seems to go with everything! Wow look at the color on that gammon? This looks great and I bet it’s tasty. Thanks Mark, it was so good. Loved the golden colour from he maple syrup. I think this gammon looks wonderful. The ingredients are simple but I am sure the perfect glaze. Thanks for sharing. Nice recipe! Though I’d prefer to bend over and check this delight once in a while! I love the smell coming from these recipes! Think I’ll make this once on my BBQ! Nice recipe thanks for sharing. Oh Lucy this looks delicious – I think you made me drool a little. 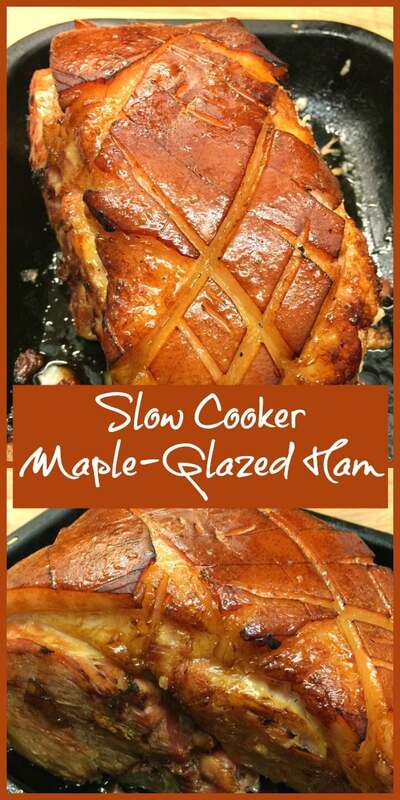 Ive cooked lots of hams over the years but a maple glaze sounds amazing! I love slow cooked joints of meat, the result is always so flavour packed and tender. Can you believe, I have NEVER cooked a ham. Love the idea of simple maple syrup glaze. Thanks for sharing my tandoori lamb too!